There have been many documented benefits of enjoying a sauna session, but did you know that it can help with pain relief and detoxification? Pain is our body’s way of alerting us to an injury that we’ve sustained so that we can attend to it. Some forms of pain such as cuts or bruises can be easily remedied, but we often also sustain other forms of pain that are not visible. Chronic pain is one such example, and heat therapy is often a good way of pain relief. Traditional saunas increase the temperature of the confined space while your body absorbs the surrounding heat to increase your core temperature. Infrared saunas on the other hand warms up your body directly, so it is able to operate at a lower temperature while increasing your core temperature. The lower environmental temperature also makes it more tolerable, so you can enjoy a longer sauna session to reap more of its benefits. Unhealthy lifestyle and diet often cause a build-up of toxic substances, including heavy metals, in the body. Fortunately, our body is able to expel these toxins on its own through the pores by sweating. The sweat composition generated from the body through the use of traditional saunas is about 97% water and 3% toxins. 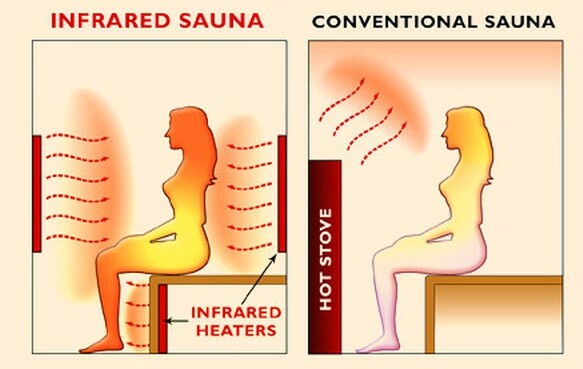 Infrared saunas on the other hand has the option of using far infrared rays to increase the reach and effectiveness of the purge, resulting in 80-85% water content, with the rest being a combination of cholesterol, fat-soluble toxins, toxic heavy metals, sulfuric acid, sodium, ammonia and uric acid. The infrared light produced by Sunlighten’s range of infrared saunas are available in various wavelengths, each with its own set of benefits. The near infrared (NIR) targets surface level issues such as fighting signs of aging and aiding in wound healing. Mid infrared (MIR) penetrates a little deeper to help reduce inflammation and chronic pain, while far infrared (FIR) goes even deeper into the body to not only help with pain relief, but also drawing out toxins from the body. Sunlighten offers a range of infrared saunas so you can have a pick of one that suits your needs. Take a look at the full range here.